why aren’t CHADWICK BOSEMAN and BRANDON SMITH . . . strutting their stuff at the awards shows – this season ?!!! except for the one lone lame performance – DAN AYKROYD, dialing it in, or on delusion tablets . . and the one white guy in the film, wouldn’t you just know . . trying to play an ole school music biz agent – his performance never even hits barely acceptable, you cringe in embarrassment every time he gets screen time, yes THAT BAD !! 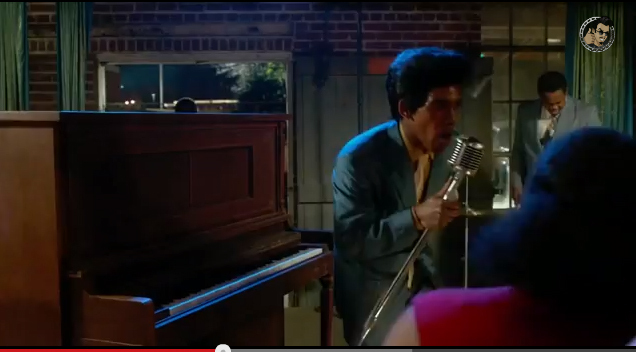 but otherwise – ‘GET ON UP’ – is on high gear . . 100%. CHAD BOSEMAN and BRANDON SMITH totally inhabit their roles with astounding abandon and sheer absolute talent. as a portrait of a real life artist – whose roots stretched back to dark deep south gospel, whose music shook the world and whose business smarts were just as astute – ‘Mr. BROWN’ to all, harsh twists and sad turns and all – can’t be beat. it makes me truly .. . ‘jump salty’. huge omission – terrible snub. a sorry situation . . beyond the beyond of any reason, just a bunch of old white geezers way past their expiry dates – blowin’ it for everybody else. SO: what a great expression: JUMP SALTY . . meaning “to become suddenly angry”. Salty old sea salt – started off as term for those tough old birds that lived their lives on the salty, briny sea, but then in 1930 the African American streetwise wise-guys played a neat twist on the word – and came up with: JUMP SALTY !! damn, wouldn’t you know it. jump and salty – crazy brilliant. I know all this cool salty stuff – because the mighty straight-talking word master . . BEN ZIMMER wrote a wonderful essay on ‘SALTY’ (and @blacklivesmatter !! ), its usage and roots – in the WALL STREET JOURNAL, this past Sat JAN 17, 2015.
definite, check it out: BEN ZIMMER – on ‘SALTY’. the film’s somewhat wimpy edit, going for the dumbed-down mainstream but still pumping terrific music – TRAILER . . . comes across slightly soft, as in leaning towards OPRAH W and ‘THE HELP’ – as opposed to as downright SALTY !! the film is in its entirety. but this is movie is no ‘THE HELP’ – and in fact, #blacklivesmatter . . where is the brilliant ‘GET ON UP’ – director . . TATE TAYLOR in the awards action, either ? ok, so he did in fact direct ‘THE HELP’, but trust me he crossed the hyper-vivid color line with this one. guess they should have circulated more press photos of TATE TAYLOR . . arm-in-arm with MICK JAGGER ? ONE, TWO, THREE – LET’S . . DO IT !! 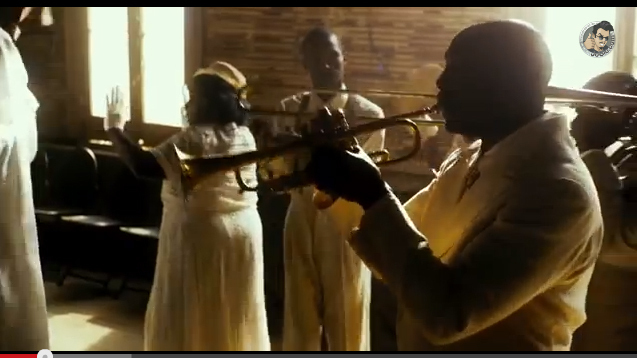 screenshot from the trailer, the sequence shot in the early deep south gospel church was . . transfigurative. wow, TATE TAYLOR really gives you a vivid peep through that . . strange powerful window. BRANDON SMITH – as LITTLE RICHARD. I could play that priceless cameo in my head til my dying days. hold onto that crazy thought !! 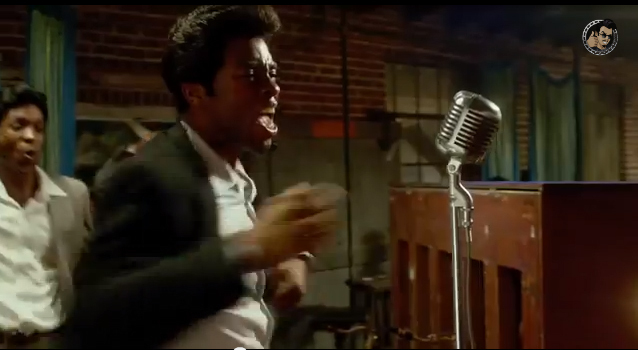 CHADWICK BOSEMAN does not just bring the real Mr. JAMES BROWN to life, he is the real – Mr. Brown, to you !! there is no stopping this guy. on Oscars night, people should just flood their screens with this movie, in protest. radiant, illuminating, and . . salty !! almost to the point of religious . . ecstasy. yeah, that BEAUTIFUL, that rockin’. except for DAN AYKROYD. like I said, MICK JAGGER – wtf ? locked into a contract ?